CHOOSE YOUR COLOR - We offer 7 original 1960’s vintage vespa colors and MORE . . If you want an unrestored Vespa, we can do that too! 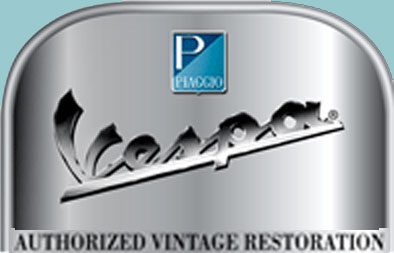 We specialize in quality restoration and sales of original 1960’s Vespa 150cc scooters, VBB Style Models, year of manufacture between 1960-1967. We are a full time, professionally trained team that specialize in rotisserie restoration and service of classic vintage scooters. With years of experience on Vespa scooters, our mechanics restore them from ground up while keeping the original look and operation. We break the original scooters down to the bare metal, inspect and restore everything from component level up, to the final assembly. Every component of the scooter is visually inspected and tested to our high standards. With our high standards and factory specifications from our engineers, our scooters are rebuilt to show and ride just like new. We have a number of 1960’s VBB Style finished scooters in house, and huge quantities of un-restored 1960’s VBB Style scooters standing by for custom color restoration. We can perform custom colors and modifications by request. Additionally, we now offer un-restored Vespa scooters, original Italian scooters offered to you in their found state. Enthusiasts desire them for a cool project, Retailers & Restaurants for visual display purposes. Please refer to our 'Project / Unrestored' section listed on the index bar, or contact us for further details. Copyright © 2006 ANTIQUEVESPA.com. All Rights Reserved.